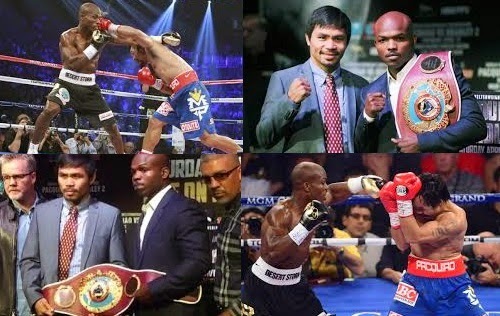 The rematch between Manny Pacquiao and Timothy Bradley will take place on April 12, 2014 at the MGM Grand in Las Vegas. This will be the journey toward redemption for Manny Pacquiao boxing glory with his previous loss on boxing fight against Bradley with questionable judges split decision for the winner on their boxing fight last June 2012. As we recall the first fight of Pacquiao vs Bradley makes Pacquiao knocked out in that fight. The fight ended and resulted to controversial split decision where Pacquiao lost with the score of (55-5-2, 38 KO) for Pacquiao while (31-0, 12 KO) for Bradley. That decision were so widely popular and most of Pacman fans disregarded Bradley won the fight and the immediate rematch was clause. Pacquiao spent his boxing career on November win over Brandon Rios in Macao. While Bradley on the other hand fought his way into "deserving" or "earning" a second date with Pacquiao by beating Ruslan Provodnikov in a Fight of the Year candidate, and then outpointing Marquez on HBO pay-per-view in October. As the boxing history is being written, Even though Pacquiao losses on the fight against Bradley last June 2012, Pacman remains the Top 1 of boxing's biggest stars , then Top. 2 in the world behind Floyd Mayweather Jr. according to Yahoo News. ABS-CBN news reported that Manny Pacquiao is now focusing in strengthening his left punch and as advised by his boxing coach Freddie Roach to utilize the “bread and butter punch” of boxing when they deal with Timothy Bradley this second time. Pacquiao is also rehired Justin Fortune, the same conditioning coach who helped him when he was just making a name in the US boxing career to make sure that Pacquiao will be at the best shape in his life when the two fighters meet on April 12. This is one of the most awaited boxing fight for this year 2014 and may result to declining or inclining career of Manny Pacquiao. We will surely watch this fight and makes that day as Holiday for Filipinos as usual when Pakyaw Fight for Philippines Pride in Boxing.